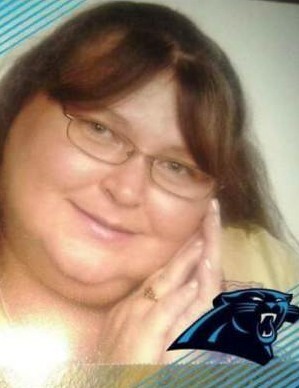 Rhonda Gail Owens, 53, of Gastonia, died Friday, April 5, 2019. She was born in Mecklenburg County, daughter of Dorothy Gail Haney and the late Benjamin Bruce Owens. In addition to her father she was preceded in death by grandfather David Sisk; a son Joseph Marion; and a brother Roger Goodson, Jr.
Those left to cherish her memory include her mother Gail Goodson; grandmother Novella Sisk; son Michael Marion; grandchildren Aqua and Jasmine Marion; two sisters Crystal Goodson and Patsy Hall; one brother J.C. Goodson; a special friend Teresa Nichols; as well as numerous nieces and nephews. A service to celebrate her life will be held at 2:00 p.m. Thursday, April 11, 2019 in the Woodlawn Chapel of Woodlawn Funeral Home in Mount Holly. The family will greet guests from Noon until 1:45 p.m. prior to the service at the funeral home. Interment will follow the service at Hillcrest Gardens Cemetery in Mount Holly. In lieu of flowers, memorials may be made to the National Multiple Sclerosis Society at https://www.nationalmssociety.org/Donate. Online condolences may be left at www.woodlawnfuneral.org.